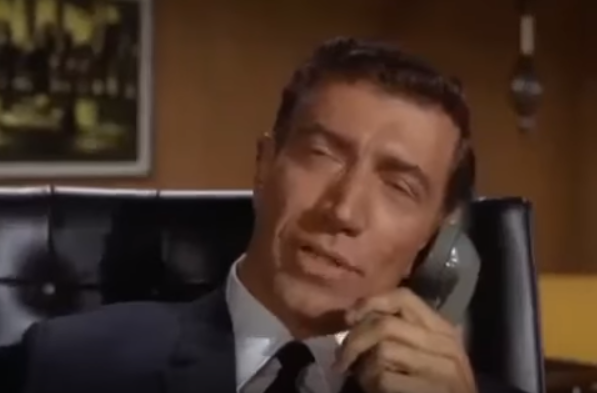 Joseph Campanella, whose acting career lasted more than a half-century, died today at 93, according to Variety. Campanella was a familiar face on U.S. television television, splitting his time between playing villains and sympathetic characters. His credits included co-starring in the first season of Mannix as Lew Wickersham, the head of Intertect, the large agency where hero Joe Mannix (Mike Connors) worked. Wickersham prided himself on devising a set of rules he said were designed to get the most of his employees. “Not me,” Mannix replied in a scene in the show’s pilot. Throughout the first season, there was a tension between Mannix and his boss. That angle was dropped starting with the second season when Mannix went off on his own. Campanella was nominated for an Emmy for playing Wickersham. He also returned in a sixth-season episode playing a different role. Wickersham was based on entertainment mogul Lew Wasserman, the head of MCA, the parent company at the time of Universal. According to commentary tracks on the first-season Mannix DVD set, Wasserman approved of Campanella’s performance. After Campanella departed Mannix, he was hired by Universal to play an attorney in The Lawyers segment of The Bold Ones. Later in his career, Campanella was a voice in a 1990s Spider-Man cartoon. The actor was also the younger brother of character actor Frank Campanella (1919-2006). Television shows from 1950s through the 1970s meant doing a lot. A typical season meant 39 episodes in the 1950s into the early ’60s, 30 or more into the mid-60s and 26 or so in the 1970s. It also required working on a leaner budget than feature films. A show may have stories around the world, but you didn’t have the resources films did. To stretch the budget, production companies utilized “stock shots,” taken from sources available to more or less everyone. In the 1960s and ’70s, it was common to see some of the same stock shots on different shows. 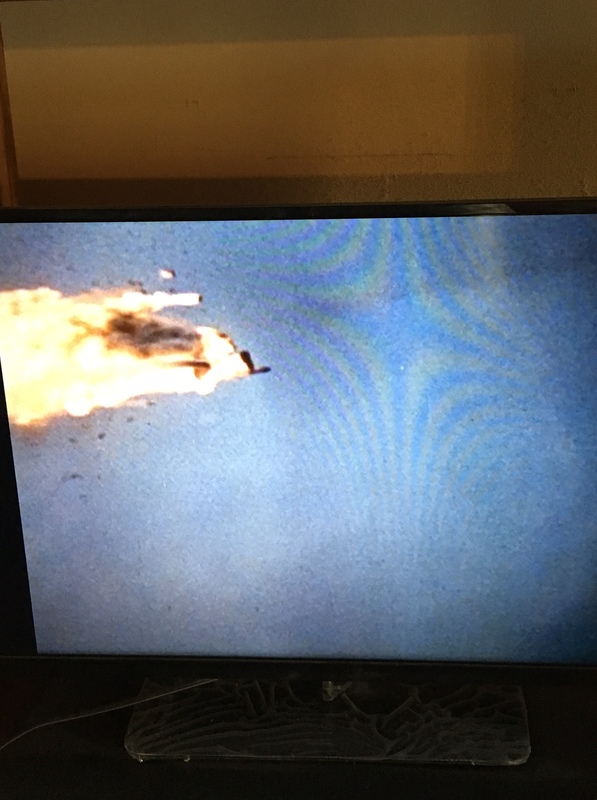 Stock shot of airplane exploding during a missile test, used in The Man From UNCLE and Hawaii Five-O. Airplane/helicopter exploding in mid-air: Based on the longest clip of it the blog has seen, this appears to be some kind of U.S. Defense Department film. An airplane (presumably radio-controlled) is shot down by a missile. Said longest version appears in The Quadripartite Affair, the third episode of The Man From U.N.C.L.E. You actually see the missile launched and see it hit the airplane. 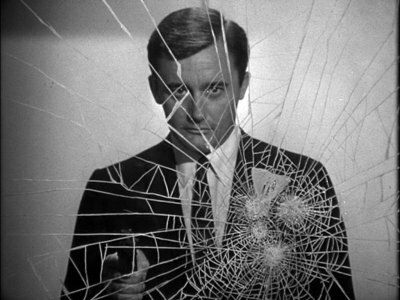 Examples: The Man From U.N.C.L.E., The Quadripartite Affair, The Love Affair (first season; supposedly the villain’s helicopter explodes after Solo has placed a bomb aboard), Part Two Alexander the Greater Affair (airplane exploding in mid-air). 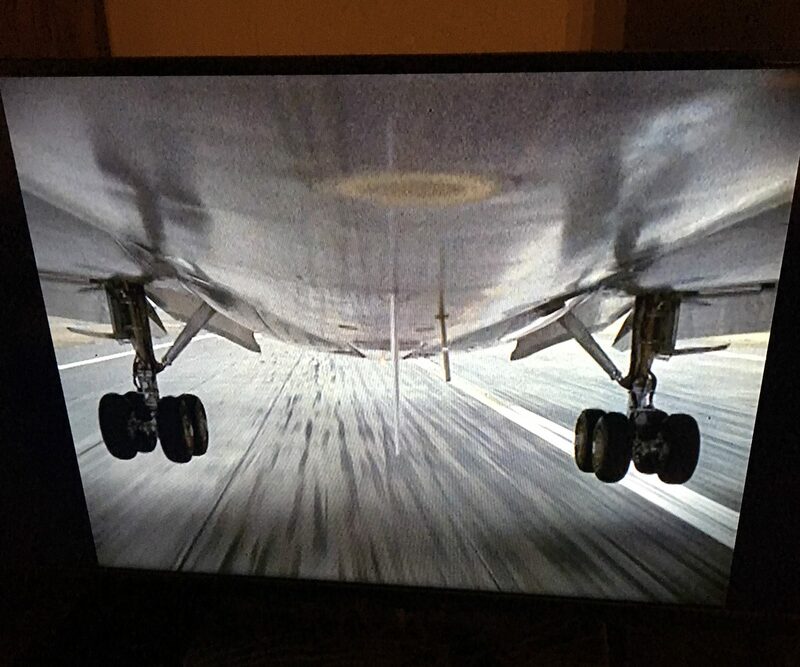 Hawaii Five-O: Death Is a Company Policy (fifth season, supposedly a helicopter with syndicate killers is shot down by police, led by Steve McGarrett), Death Thy Name Is Sam (eighth season, villain John Colicos shoots down a helicopter piloted by undercover cop George Takei with a portable surface-to-air missile). Aircraft about to land: One of the most common seen stock shots during the period was of the underside of a aircraft about to complete a landing. It was used a number of times in Hawaii Five-O (the image at right is from the episode Three Dead Cows at Makapuu Part I), where characters were flying into Hawaii all the time. I know it was used more frequently than that, but tracking them all down in daunting. The whole idea was to communicate movement to the audience. Sometimes, the lead character might be traveling somewhere and this shot would be used to demonstrate he or she had arrived. Stock shot of exploding car. 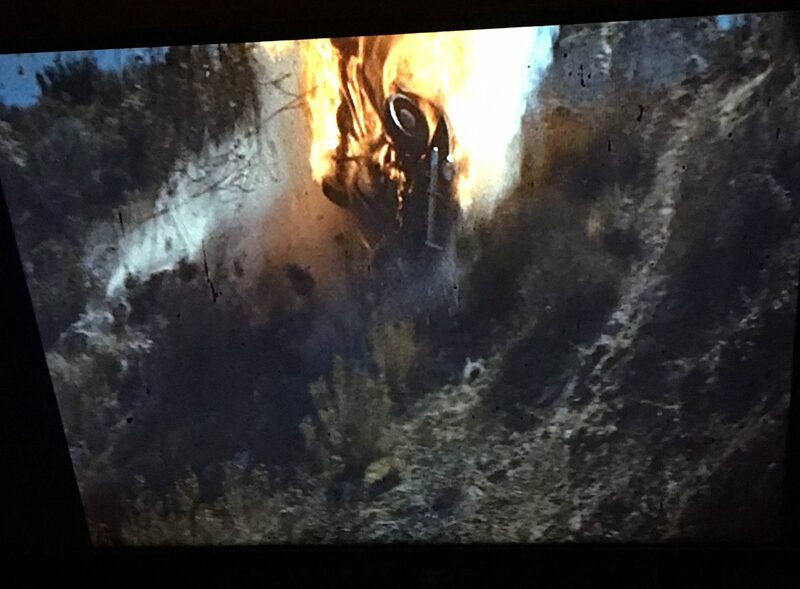 Car Exploding on side of mountain: It costs money to blow up a car or truck. One way to save costs was using a stock shot of one going up in flames. The image at right was used at least twice. In the first-season Mannix episode Deadfall Part I, an Intertect investigator (Dana Elcar) fakes his own death with his car exploding. Mannix (Mike Connors) investigates and finds out his Interect colleague was was involved in an industrial espionage operation involving a new laser. The stock shot also was used in an episode of Ironside, Poole’s Paradise. At the start of the series, the wheelchair-bound detective (Raymond Burr) rode in the back of a 1940 truck. Early in the third season, the truck had to be sacrificed (to throw a corrupt sheriff and his thug deputies off the trail). The stock shot was used to show that vehicle exploding. The sleuth rode (and eventually drove) a more modern van for the rest of the series. UPDATE: The exploding car shot also shows up in Nine Dragons, the first episode in Hawaii Five-O’s ninth season. Arch-villain Wo Fat is at the University of Hawaii, posing as an academic who defected from China in the late 1940s. However, a university faculty member who knew the real academic confronts Wo Fat. Bad move: Wo Fat has his goons kill the Hawaii faculty member. They put him in a Lincoln Continental, shove the car down a ravine and the car blows up. 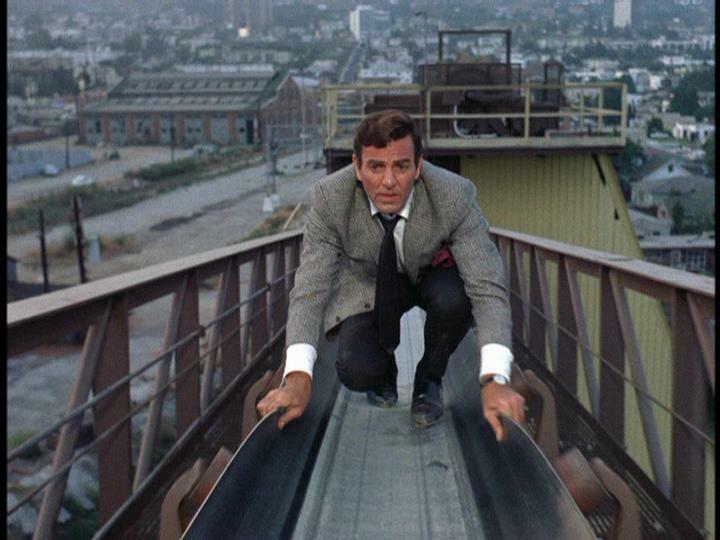 Mike Connors in a first-season episode of Mannix, an image used in the show’s main titles. Mike Connors, who often played rugged but likable heroes, has died at 91, according to an obituary posted by Variety. Connors was best known as the private eye title character in Mannix (1967-75). 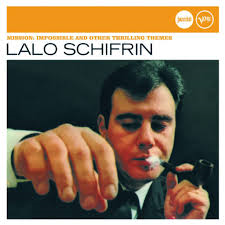 But he also participated in the 1960s spy craze as the star of Kiss The Girls and Make Them Die, a 1966 film which had a plot very similar to the 1979 James Bond film Moonraker. Connors was athletic, having played basketball at the University of California-Los Angeles under legendary coach John Wooden. For a time, he was billed as Touch Connors, a nickname he picked up from his basketball days. He displayed his athleticism in the Mannix pilot, written by Bruce Geller and directed by Leonard J. Horn. In the story’s climax, a helicopter piloted by a killer dive bombs Mannix at a California desert golf course. Images from the sequence would be incorporated in the show’s main and end titles. In the show’s first season, Mannix worked at a large detective agency with a rigid set of rules devised by owner Lew Wickersham (Joseph Campanella). This was devised to set up a conflict of the individual (Mannix) coping with the system. Wickersham was based on Lew Wasserman, the head of MCA Corp., the then-parent company of Universal Studios. During that first season, there was a recurring bit where Joe would demonstrate to Intertect just how good he was only to purposely goof up. In one episode, while on the firing range, he fires bulleyes at the first three targets perfects and then purposely miss the next five. In another, Mannix and other Interect operatives went on a foot race. Mannix would have easily won but decided to go off and enjoy a smoke instead. That was all thrown out in the show’s second season as Joe struck off on his own, helped only by his secretary Peggy Fair (Gail Fisher). Mannix absorbed a lot — A LOT — of punishment throughout the show’s eight seasons. As played by Connors, he was both tough and compassionate, always on the side of the underdog. Prior to Mannix, Kiss the Girls and Make Them Die was an amusing project for Connors. The film included a sequence where agent Kelly (Connors) climbs into the Christ the Redeemer statue, fighting off enemy operatives. 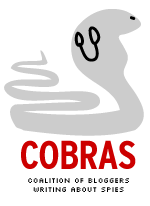 The actor’s career was extensive, with his IMDB.COM entry listing more than 100 credits.